Since Kotaku blew the cover off next year's major Assassin's Creed, tentatively titled Victory, reactions have run the gamut from excitement to anger and everything in between. To say this year's installment, Unity, is a divisive game would be an understatement of epic proportions. Like it or not, Ubisoft Quebec is hard at work on Victory. Let's look at five things thatcould make it the best game in the series. Unity's co-op content was a good start, but it didn't take the concept far enough. Players could drop in and out of your game, but there was only a specific subset of missions you could do as a group. Outside of these missions and heists, you were left exploring Paris, which, while gorgeous, isn't an ideal group activity. It doesn't take a rocket scientist to see that Victory needs to open the floodgates to triumph over its predecessor. Let gamers play any mission in a group, including story content. If Victory retains and improves upon Unity's open-ended assassination missions, the implications could be huge for the franchise. Fortunately, this year's Assassin's Creed survey sent to Unity players asks a few questions about having co-op extended to story content, which is exactly what Victory needs. I'll start with the obvious: Ubisoft needs to let players make a female assassin. Even if that character is an avatar only for use during co-op, it needs to happen. The Unity fiasco is proof enough that gamers want this. Beyond choosing your assassin's gender however, Victory would do well to allow players to further customize their assassin. Let's choose their facial features and build. While we're at it, let's also allow recoloring of all outfits, too. And not just the ones you buy, but the ones you unlock. Of course this is assuming Victory includes unlockables like every other entry in the franchise has. The pace of combat in the Assassin's Creed series hasn't changed much since the series' 2007 debut. We're still playing the sort of rhythm game of waiting for the right sword attack to parry or dodge while planted firmly in one spot. While combat has certainly been made harder, the system itself is starting to feel a bit dated. For someone that parkour up and down just about any structure, Arno felt kind of stiff in combat, in fact you don't need to look very far to find games that have done Assassin's Creed style combat better than Assassin's Creed itself. Victory would benefit greatly from an overhaul of the AC combat system. Ubisoft need look no further than Shadow of Mordor or the Arkham games for inspiration. Both games feature fast, fluid combat systems that would fit Assassin's Creed so incredibly well it's almost ridiculous. Being able to leap from opponent to opponent in the middle of a large group fight is utterly gratifying, or in the case of Mordor, executing opponents mid-battle is always an amazing feeling. If there's one complaint that I've seen universally leveled against Unity, it's that the franchise's trademark present-day segments were gone completely. Ubisoft Montreal tried to make the player part of the narrative by replacing them with a loosely tied together experience involving the Assassins talking to you as though you were an initiate, but it just didn't work. The present-day segments in the series were at their best earlier in the series, where Desmond saw actual exploration and combat, but I'd even be willing to accept a retread of Black Flag's (and Rogue's) first-person IT tech simulator style interaction. Victory needs to bring these back, they're a big part of the series and without them it just doesn't feel like an Assassin's Creed game. Just give us something, anything. Unity had a lot to do. The map above, taken from my review was already about 30 percent complete. For me, that's a good thing. I'm still playing Unity even now. The problem however, lies in how many of these things are locked behind Ubisoft's problem-riddled Initiates and companion app. For Victory to succeed, Ubisoft needs to either scale back or give players the option to remove connected content. It rubbed gamers the wrong way. Having companion apps and connected activities are good, when they're well executed, but it's important to give the player the choice. Not everybody can afford a smartphone or tablet, that doesn't mean they should miss out on everything the game has to offer. Offer some kind of alternative and you can make everyone happy. That's it. If Ubisoft Quebec, who is helming a major Assassin's Creed release for the first time, nails these five points they could very well make the best Assassin's Creed game ever made, and that would be quite the feat. 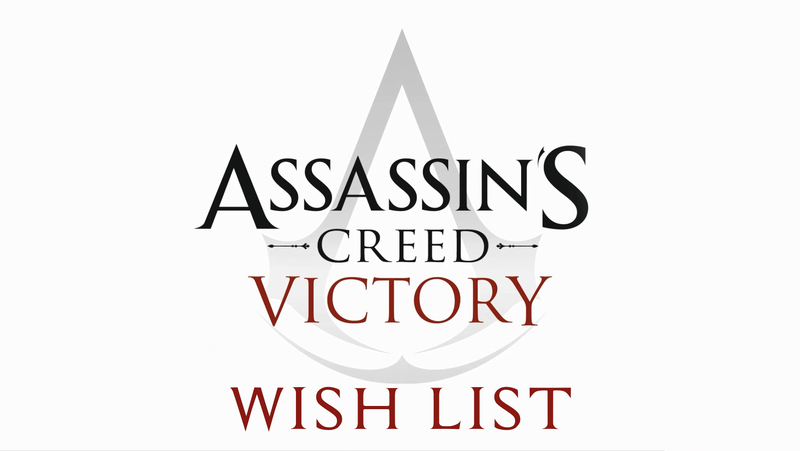 What's on your Assassin's Creed Victory wish list? What do you want to see? Let me know in the comments.